Narrating Life: Your Comments are Welcome and I Appreciate Your Feedback. Your Comments are Welcome and I Appreciate Your Feedback. I need a new jewelry system you guys. I suppose it would be more accurate for me to say that I need "A" jewelry system. Let me give you a visual of my current ummm...situation. First I take this little brown box off of my dresser that is already covered with stuff because OH MY GOSH WHY AREN'T THERE ANY SHELVES IN THIS HOUSE. Anyway...this is the box I keep all of my earrings in. 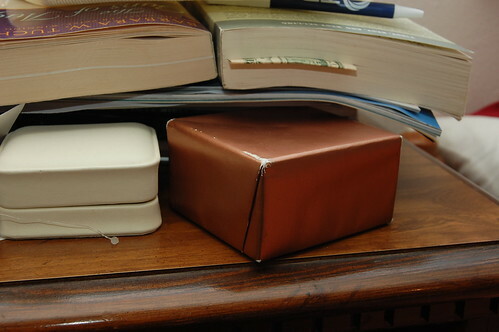 I think it is the box that my sister-in-law's fancy wedding ring box was held in. Sorry if you wanted to keep that Laurel. I suppose you could have it back but...I'm kind of using it right now. Okay so, I take the box off the shelf and I dump its contents onto my unmade bed. Usually in a crazy panic because I'm late and trying to run out the door. Although, even if I'm not in a hurry I prefer the dumping method because it's just so dang efficient. That's right guys, I don't even make my bed for blog-land. I don't make my bed. It's who I am. Plus this isn't about my bed it's about my jewelry. 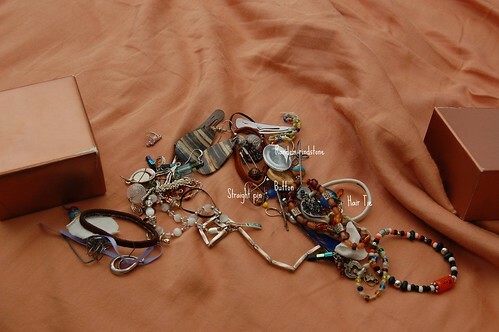 So anyway, as you can see I have a nice variety of non-jewelry items along with my earrings and bracelets in this box. Straight pins, buttons, shiny things that I've picked up and put in my pocket...you get the idea. Sometimes I find the earrings I'm looking for...sometimes I don't. When I'm done, I take my flat hand and scoop them all back into the box trying to not get stabbed by the straight pin and back onto the shelf it goes. So now I need a necklace right? For these, I must go into the bathroom. I have them hanging here on a towel rack above the toilet. You know, so they can get all steamy from the shower and rust up nicely. I also like how I almost drop them into the toilet every time I try to get them off or put them back. Awesome. Do you get the idea now? Do you see why I need your help? In my quest to fight frumpy mom-ness I've vowed that I will wear earrings everyday but this lack of organization has got me down. It also prevents me from buying new jewelry because I'm afraid it won't get taken care of. I briefly considered this little project of cross-stitch fabric on a hoop hung on my wall...but clearly I am not inspired by this idea because It's been sitting unfinished for months now. HELP! Seriously, I'm not kidding you guys! What do all of you do with your jewelry? (I'm looking at you Denise). I need some suggestions before I do something drastic and horrible like buying a Caboodle from Goodwill. I do not have a good way to store necklaces. But I saw in a magazine once this really cute arrangement of hooks mounted on the wall to hold them. And Oprah supposedly has an assortment of pretty little candy dishes and things decorating her vanity to store all of her jewelry, which makes the jewelry look almost like a decoration. But I do like my way of storing my dangly earings - I have a crystal candy dish/pedestal bowl that someone gave me as a wedding gift that I hang the earrings on around the outside edge. The corresponding necklaces go inside the bowl (you sorta hafta untangle the necklaces each time you want to wear them, but I don't wear necklaces very often, so it works for me). I wedge my post/stud earrings into the ring section of a jewelry box (you know, the part that has those rounded rows thingys) and they stay in pairs and aren't rolling all around. They are easy to get out and return too because you just plant them back into the grooves as though they were flowers. mary kay has an awesome jewelry organizer for $10 or $15 bucks that I am going to order! It is a hostess gift, but you can always buy it. It is HUGE and oh-so organization friendly. I feel your pain...or at least I used to. My sweet in-laws got me this amazing jewlry organizer. It hangs on my wall and is covered with open slots on the front, which I inserted delightful pictures of my adorable family into. When you open the door, it has several hooks for hanging necklaces, racks for earrings, slots of rings, a place for bracelets and cubbies in the bottom for those "shiny things" you keep picking up. :) Seriously, it has cleaned my room up a ton and saved my jewelry from my jewelry thief of a son. (go to jcpenney.com and check under jewely, armoires and boxes). Loves! Ok, let the record show: I, infact, had a Caboodle (pink and green) when I was a kid... but that line did make me bust up laughing! I had a similar problem, until I found a cute, small jewelry box that has drawers, hooks, places for rings, ear rings, etc. And the best part is I found it at a garage sale for $10. I love how Charlotte and Emily hang their necklaces and ribbons on the wall (see pictures on Emily's blog). I don't have pierced ears, so I don't have the ear ring problem. The only thing I have heard of is those ear ring tree things. Charlotte Peterson keeps her jewelry in a type of tackle box(you know, that normally holds fishing stuff) that is clear. It helps keep the pairs of earings together which is nice because she cannot see to find the match! But it was all very organized and in a drawer. But she did hang necklaces on hooks on the wall. I have one of those bendy grid thing that you can hang on the wall, and that's where I keep my necklaces. I keep my earrings in a small little glass box I was given as a present one time (this does require some digging sometimes, though). If you want to see the wall-hangy-thingy, it's on a recent post on my blog! I'm not sure where Mom got it, but I don't think it was that expensive! Good luck! A Caboodle from Goodwill? Perish the thought! 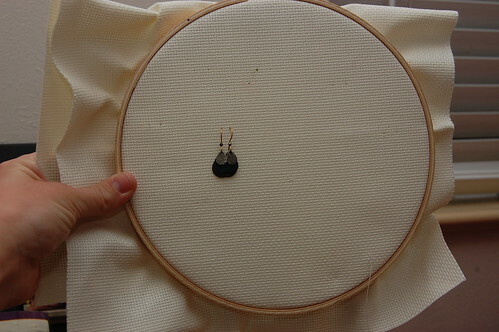 I buy those little 2"x2" mini ziplock bags for my larger earring (as well as ones that cannot be hooked together. You can buy them at Hobby Lobby, or in bulk at XPedx). I also put smaller necklaces in them. Once they're in the little clear bags you can store them wherever--I have some in a fabric-covered jewelry box and some in just a little gift box inside my armoire. My larger necklaces are hanging on a set of mounted old door knobs in my bedroom. Thanks to my sister's generosity I may have to expand to something that can accommodate more necklaces, as mine are starting to get tangled. I bought the thing Charlotte just mentioned at Hobby Lobby on sale for $10. Okay, clearly you do need help here, Miranda. 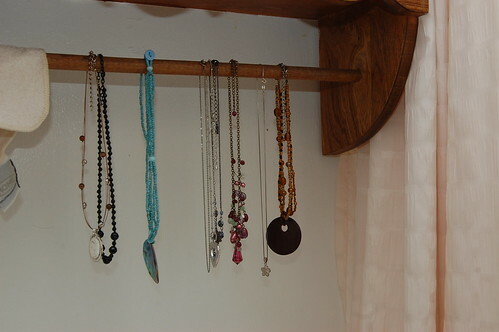 I have my necklaces hung on one of those stretchy peg things such as Charlotte and Emily use. My earrings are in a jewelry box that my mom gave me. When I went to the Beehive Bazaar recently, I saw these really cute jewelry holders that someone had made. Basically, it is a smallish open frame with wire strung across the back at maybe 2" intervals. Hang jewelry on the wires. I found a shelf at Tai Pan Trading that is made of thick, flat, strips of wire. I hung that on the wall and hang my necklaces through the wires. I regularly drop the necklaces so don't know that this is the best solution. Once I've word the necklaces, they only get hung back up every couple of weeks so they clutter my dresser most often. Below the shelf I hung a hook bar that I bought at Target (4 hooks on a piece of wood) - that's where I hang my anklets. Picked up some blingy drawer pulls/knobs at Hobby Lobby and hung those above the shelf. These are for my bracelets. My earrings get put through buttons (1 pair per button) and placed in a jewelry box that my brother gave me while I was in high school. p.s. I'm cracking up that you apparently used money as a bookmark. While storage items in my home MUST be functional, I can't deny that I love a little form to sweeten the deal. Check out this little pretty. An old empty picture frame - just the outside wood with screen (from windows) stapled to the back in place of the glass to hang earrings. Add knobs to the side or bottom for necklaces. Hang like a photograph.